Welcome to the new year. The year of success! But to make this year a success, we, of course, need to get some things ready in this first month that will help us. Like many people I started this year with some wild plans. And like may people some of those plans I will probably forget within the first few weeks and not think about again until the next year. But I really wanted to make and effort to get my business, blog and art goals going. Therefore, I made sure I did these things in the first month (even the first week) that will help me make these things come through. These things work for any goals, but I will be mostly talking about business and blogging. Reviews learn us what has worked and what hasn’t. The best reviews give us an understanding both of the past and the future. There are so many review questions and options out there. If it is for your business, blog or creative life, make sure you find a way to make a review that gives you a clear picture and tells you things you actually want to know. If you are not interested in al the things that didn’t work because it doesn’t motivate you and you already have a rough idea, make sure the questions you ask yourself don’t focus on that. After you have made the review, make sure you keep it close for the rest of these things. Almost everybody makes new years resolutions. But to make sure your blog/business is thriving it is important as well to set new goals for this aspect of your life as well. See it as a way to refocus. What are the things that are really important to you in your business? Are there any new projects or skills you want to work on? Like all new years resolutions, however, you also need to make sure your goals are attainable, so you can stay motivated for them. More on goal setting will follow! (I am learning super much about it right now.) 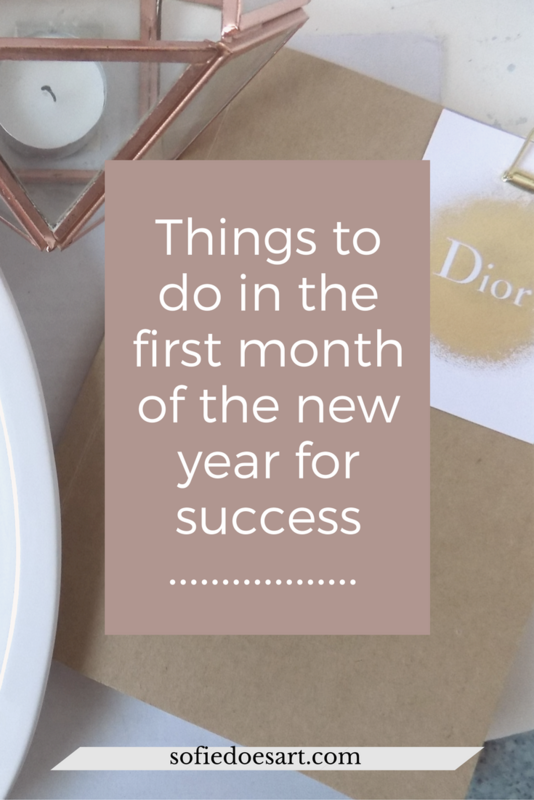 If you want to know what other topics might be discussed this month make sure you check out my 2017 goals! A good start for you blog or business also means knowing what is coming up. Planning ahead is a goog way to set up a plan to get your goals. And make sure to use your review of the last year to know what will work and doesn’t work. There is no set time that you should plan ahead for. Some people can plan for up to 6 months, make that a successful planning, and keep it. But if that is not for you keep it simple with a short planning. How can you make the first 21 days a success or what are things you need to set up in the first month that can help you through the year? As a side note, the first month is a great time to try and get those systems in order so you can spend the rest of the year on focussing on the rest. If you need a new planning system, this is the time for research and trying. This also goes for new tactics, tips and tools. If there was anything last year that didn’t run smoothly, say for instance coming up with new ideas, this is a great time to find a system that will help you with this. While planning out your own first few moments of the new year here is something else you should plan. If you are using one planner for the next year, make sure you note every single important date you can think of. Start with major holidays, birthdays and such. When you have those, think about events in your niche. Launches of bloggers products or important business and companies in your niche and so forth. This way it is easier to stay up to date and of course to plan around these things. I am sure there are many more things you can do to make your year successful. But these are the things I thought of and that seemed the most useful and productive. Like all things in life, though, there are many different ways to do this. So if you have anything to add that you think will surely lead to success, wy not shre it in the comments below?